Boooo! So we went to the doctor today- nothing, nope, nada, nowhere near ready. That's what she told us. UGH! I can't stand it! Oh well, I guess we'll keep on waiting. I read in a book that your baby needs to feel welcomed so Chad and I have been talking to him- like we drove by baby cows today and I pointed them out and said "If you were here you could see them too" We passed a construction looking thing- maybe a backhoe.." Oh William, doesn't that look like fun" See he's welcome to come into the world, now why won't he join us? I did run some errands and picked up a bike computer for the stroller so I can clock our walks- avg speed, distance, my heart rate, etc. I think the nerd in me will like to keep up with the data. Mary katherine gave us a great car seat adapter for the stroller where the carrier just pops in until he's big enough to ride in the seat- we/ I love it! 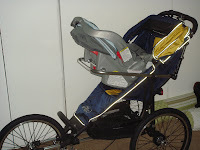 I'm going to get Chad to help me install the bike monitor tomorrow on the stroller...see his stroller is ready, why won't he come join us??? His nursery is as finished as it will be- until I decide what I want on the walls. Here are a few pictures. 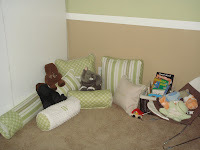 I've made a couple more pillows for the reading corner and he recieved lots of great books at showers...why won't he come chill in the reading corner and look at all of these great books???? Oh my word its just hurry up and wait isnt it!!! I remember waiting for Rylie....ohhhh the agony. I have no doubt it will be the same again. Do lots of walking, up hill. It didnt work for me but thats what everybody says to do! Maybe the bike moniter scares the wazoo outta him. Te he... jk, jk. (Shouldn't joke with a pregnant lady, yes. I. KNOW.! Can't help it. Especially since Sarcasm is our native tongue.) HO-LY crap, can't believe you're going to have a BA-BY in mere days!!!!!!!!! Weren't we just on Long Hill Street not too long ago? Time flies. Wow. Am in awe. You go, girl. oh my goodness why won't you come play william, we have some hot baby girls that you would love to meet if only you were here. maybe we could guilt him into coming out, you know i was raised catholic, and I am italian, i got this guilt thing down! and i waled all over this town and BellaRose came right when she wanted. Well, at least maybe we'll be able to keep our lunch date next week :) But then after that, William has no excuses, especially b/c his room is SO cute he has to come see it sooon!!! Love the Will and Grace font on the pillow!!! glad you noticed the font- I too liked it :-) and I do hope I get to go out to lunch with you next week Courtney! I will talk to baby William about all of his blogger babes- maybe he's more interested in girls than cows and construction work :-) good idea Sunday! They can't stay awake for more than 20 minutes at a time, yet they need to feel welcomed in order to be born?